I finally upgraded my shop lights from fluorescent to LED and couldn’t be happier. I contacted American Green Lights for suggestions and ended up making a complete switch. For full disclosure this isn’t sponsored, I have nothing to gain or lose if you do or do not buy their product, and I am not being paid to write this article or make a video. However, I did ask to be provided the lights in exchange for sharing the results of the upgrade, good or bad. Now that the switch is complete I’m a huge fan of the product and the results but I don’t want my opinion to be the reason you do or do not buy something. Instead, I want this article to provide actual information with an A to B comparison that will let you see the results to and use that to make a decision for yourself. As a bonus for you the viewer, Jim from American Green Lights said that anyone who mentions seeing the lights on my Instagram or YouTube videos can get a 10% discount on the product and free shipping. Simply email your desired items to jaybatesoffer@americangreenlights.com. Before we get into the results lets first talk about the “before” setup and the problems I was having. My shop is roughly 20′ x 20′ with 10′ walls. I have six 8′ T8 fixtures, each with four 4′ T8 bulbs, mounted to the ceiling. The four going in the same direction were installed a year prior to the two in the opposite direction. Same hardware vender, same product, same 6500k bulbs. I wanted to know a little more information in regards to the exact problems I was having with my current setup so I emailed some questions to Jim. In the following few paragraphs the problems I sent to Jim are in regular text and his comments are in bold. Everything is green when recorded on camera which makes the white balance difficult to set. I have to boost magenta in the camera to compensate. ***** The green color is an unfortunate characteristic of fluorescent lamps. In the chart below, you can see the peak of the light output spectrum of the fluorescent is green. Then there are specific other weaker peaks at orange, yellow, with little peaks at cyan, blue and almost no red. As you can see, the LED lights have significant energy emitted at almost every wavelength along the visible spectrum, therefore providing better color accuracy. The lights are losing brightness. I shoot with a manual exposure in the shop and I’ve had to raise my exposure a few times over the past couple years with no changes in lighting. ***** Fluorescents degrade over time. Though they rate lifetime at as high ahs 40,000 hours per tube, they mean average time to complete failure, not taking into account degradation. If the lamps is operating at 10% of original lumens, it still has not “Failed” per their specs. As the fluorescents burn, the electrodes inside the ends of tubes oxidize, causing the blackening that you see at the ends of the tubes over time. As the oxidization increases, the contaminated vapors in the tubes allow less UV light to be produced, which to react with the phosphors. This causes lower light output. Another impact for people in colder climates with garage shops, Temperature will greatly affect light output in fluorescent tubes. 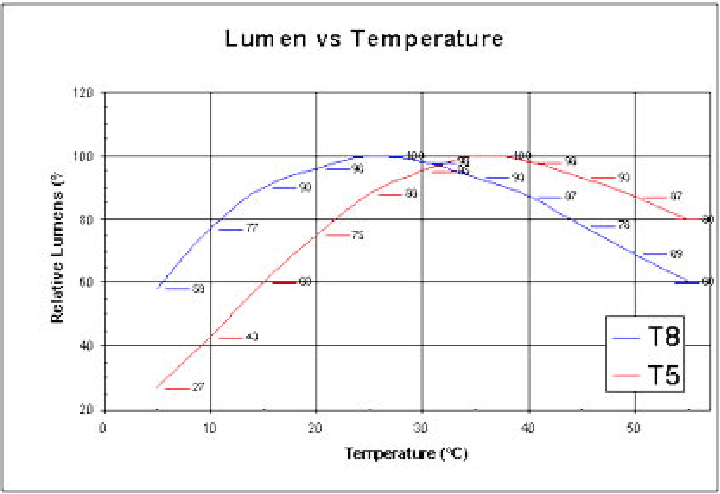 As you can see on the chart below, at 5 degrees C (41 degrees F) the T8s will lose 49% of its lumen output compared to 75 degrees F (25 degrees C) That does not even count the loss from oxidation! The balasts are going bad I think. Sometimes it takes a dozen flips of the light switch to get all of the lights to turn on properly. ****I think you are correct. 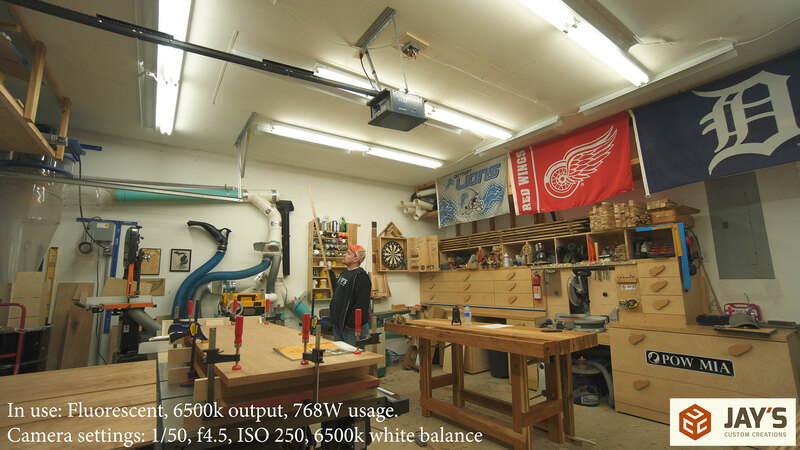 Ballasts generally will last about 15-20,000 hours of continuous use. Each time it is switched on and off degrades and shortens the lifetime slightly. Capacitors are generally the weakest link. Some cheap ballast use capacitors rated for 2000 hours. Everyone is telling me to go LED and I have no experience with them. I don’t know which products to switch to for an equivalent or better lighting situation and, most importantly, a more true color experience. These are 6500k which is a little bit too cool for my liking. I’m looking for true colors on the camera, not warm, not cool. 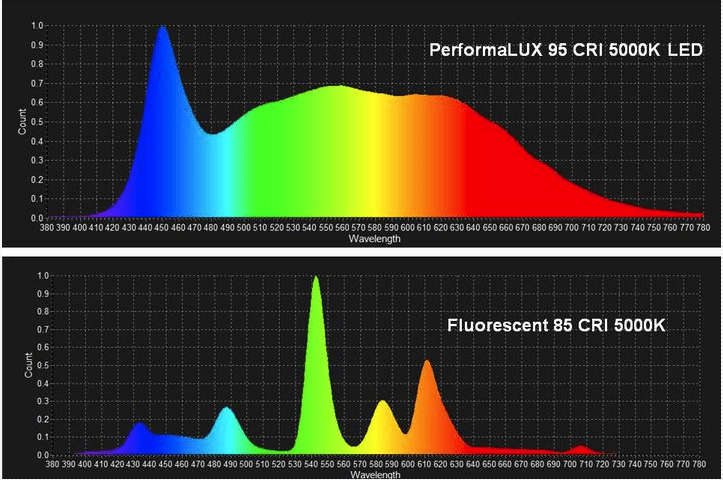 **** the 95 CRI (color rendering index) and full spectrum nature of our LEDs will certainly improve your video work. 5000K is the most neutral, matching summertime sunlight at noon on a clear blue cloudless sky. Because LED lights are directional the strategy for lighting was a little different. With the fluorescent fixtures I didn’t have any hoods or anything to direct the light down. My thought was the more light the better and just let it bounce down off the white ceiling however it can. On the other hand, the LED’s are a directional light source meaning they shine light in one direction. This can be a pro or a con depending on what you are trying to light but for my situation where I’m just trying to light my work stations it’s a non issue for me. The new light setup consists of four 24 watt LED panels in the center of the room and ten 48 watt LED panels around the perimeter (SL-4L product number at American Green Lights). This results in great lighting at all of my perimeter tool locations and a lot of spill light from the perimeter lights to help light the center of the room where the lower powered lights are. The fluorescent setup has 24 bulbs rated at 32w each for a total of 768w of lighting. The LED setup has four 24w panels and ten 48w panels for a total of 576w. On paper you would think that the fluorescent lights are brighter because they use more power but that’s not the case. The lesser powered LED lights produce a much brighter work environment, as you will soon see. To measure how bright the lights are I used an app on my phone called Light Meter (Android). It does have settings for calibration but I didn’t change anything because I’m not looking for precise absolute values. Instead I’m looking for relative values to compare the two light setups. The app uses the proximity sensor and provides a Lux value (Lux is used to measure the amount of light output in a given area – one lux is equal to one lumen per square meter. It enables us to measure the total “amount” of visible light present and the intensity of the illumination on a surface.) For an example, I’m writing this article at night in my office with the only light sources being a 23w CFL bulb and the light from my monitor and no matter which direction I point the meter the highest reading I get is 81 lx. 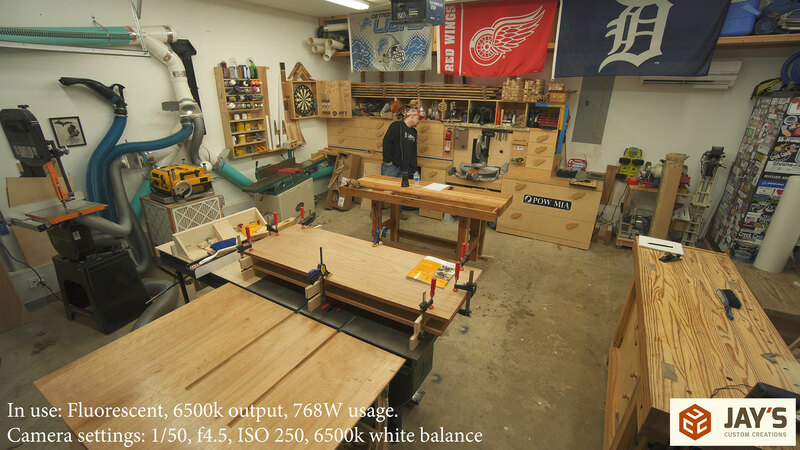 In the shop I have multiple work stations so I want to take multiple readings and see how well lit each area is. For each light source I’ll place the phone in the same location and orientation and try to lean away so that I do not cast a shadow on the phone. I took readings with the LED lights, with the fluorescent lights immediately after turning them on, and with fluorescent lights after allowing them some time to warm up. Here are the results measured in lux (higher is better). So how’s the color quality of the LED’s compared to the fluorescent setup? I purposefully left the fluorescent fixtures hooked up on their own circuit so I could flip between them and the LED’s to really see the difference and have good examples to show you. It’s a night and day difference. Such a huge improvement in accurate colors with the LED’s. What stands out the most to me is the reds, browns, and orange tones. When looking for lights remember that a higher CRI (color rendering index) will result in more lifelike and accurate colors. The following images show the shop under LED light with the camera white balance set to the same value as the rated output on the LED lights which is 5000k and the shop under the fluorescent light with the camera white balance set to the same value as the rated output on the fluorescent lights which is 6500k. No other color corrections were made. Typically I would boost the magenta in the camera to offset the green hue of the fluorescent lights and also apply a rather heavy color correction on the computer but in this case I wanted to show the camera set to exactly what the lights were rated at. I switched over to LED bulbs about 2 years ago with very positive results. Very easy to use the existing florescent fixtures and replace the bulbs with LED’s. There are LED’s that can run off the ballast of the florescent bulbs but the best way is to rewire the fixture to have the power go directly to the LED’s. Reasonably priced on Amazon. Has anybody noticed a notable reduction in their power bill? The only way you are going to notice a drastic difference is if you run a lot of lights all the time. I doubt the majority of people will notice a drastic difference but there will be one long term. I have noticed a remarkable reduction of my power bill. That said, the only light fixtures in my home and shop that are not now LED are two chandeliers in my dining room and breakfast nook. I can’t find decorative led bulbs for the small base that look good exposed. They’ll turn up sooner or later. 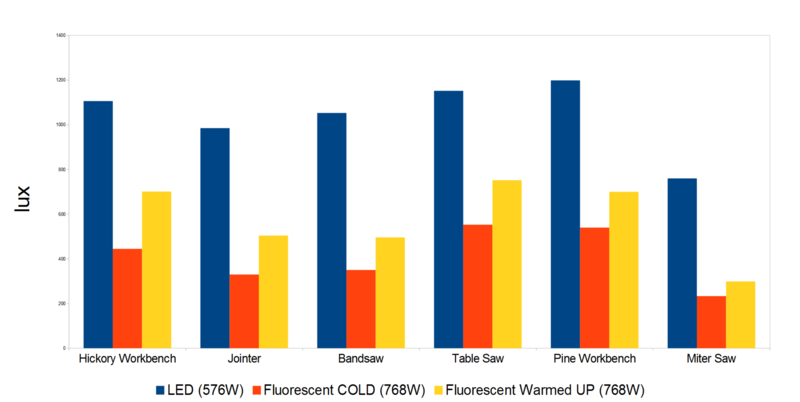 how do the LED lights perform in colder environments. I know that Flores ent lights may not startup in colder environments unless they are specially rated for the cold. Is this the same for LEDs? My experience: I live in southern Ontario, Canada. My shop (unheated garage that never sees the car) does get cold in winter. I replaced incandescent bulbs with fluorescent tubes that were (supposedly) specially designed to operate in cold weather; they weren’t too bad insofar as light produced- initially. 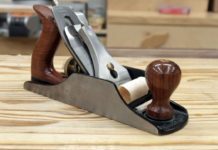 Within a year, regardless of season, I needed to open the garage door to see well enough to use my table and band saws and jointer. Not comfortable in January. Last Fall I replaced the fluorescents with one 4′ LED two tube fixture (daylight @5000K). The difference in brightness and quality was astounding. Now, I’ve only gone through one winter, but considering that LEDs have a very long rated lifespan, as well as being much more energy efficient, I’m looking forward to a more economical and “bright” future. Hope that helps. Good info guys. Thanks for the input. Jay, this is a great video and very informative. I switched over to LED’s about a year ago and I was just as excited with the results as you are. I really enjoy your videos and always look forward to the next one. 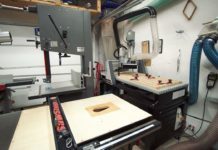 I used LED lights in my workshop from day 1 and have now changed all the bulbs in the house to LED’s much better light. The pictures with the old lights almost look like they have a filter on them! I switched my home over to LED’s and noticed a significant reduction in my electrical consumption. Check with your local utilities, some offer free programs where they will install LED lights for free as part of an assessment. Jay, was there a calculation used to determine how many watts/lumens you needed? I CANNOT believe how timely this is!!! I want to upgrade my fluorescent shop lights to LED’s as well!!! Only difference is they are in a four car garage. There are two roll up 16′ doors, open space is 24′ deep (had to fit a crew cab full bed PU in there) by 45′ wide. Ten foot ceilings. 16 four foot two lamp ceiling mount strip fixtures (no reflectors), Light switches control front/back lights in pairs or two pairs by three way switches. Overall 1080 sq feet of open garage, but my mother’s ’65 T bird and Volt live in there, with four large shelving units and Sauna. Anyway, that is 32 bulbs with 2 more over the workbench under storage cabinets above. I’ve been struggling with the change to LED for months, trying to do it the smart way (like you). ANYWAY. Would not opening an older video you did alongside a new one show the lighting difference? Whoops. Looks like you did post comparisons!!! Sorry, bit of a snore. Way too much techi stuff. I installed 9 cheap Menard’s 4 foot LED fixtures in my shop 2 years ago and they are now so dim that I’m going to have to replace all of them. Do the one’s you used have a rated life span as far as loss of brightness. I understand that quality LEDs have an L70 rating that predicts how long until they reach 70% brightness which is considered end of life. Finding that L70 rating seems to be difficult. I had to turn on my American-to-English translator to understand that your ‘bulbs’ might be our ‘tubes’. As you do, you provided another good evidence based research that will help others. 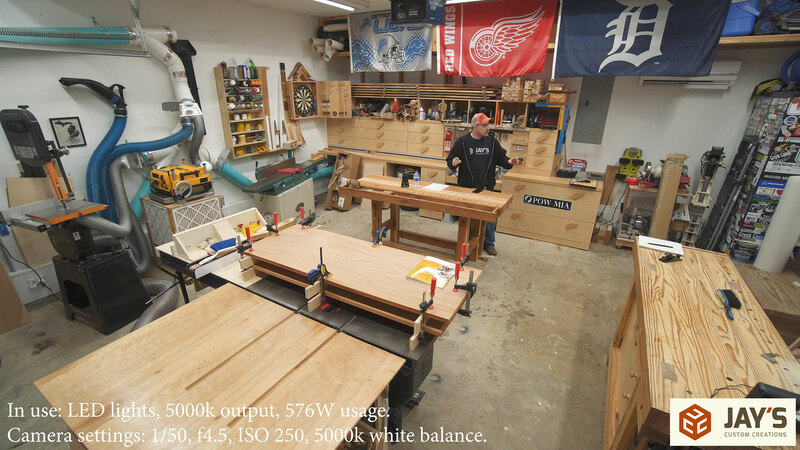 I have had LEDs in my workshop for a number of years and my experience matches your findings. My LED ceiling units (with bulbs/tubes) have reflectors at their top and diffusers on their underside and this combination spreads the light from the units evenly and without shadows. I have small clusters of LED spot lights set above and about machinery to give more concentrated light on working spaces. LED lighting fixtures now come in many shapes and configurations and are easy to install where wanted. In Australia they tried LED Lights on the roadways, Motorways in the country etc and they have been causing more accidents by dazzling the oncoming cars. Car LED LIGHTS are causing accidents by dazzling the oncoming car. Since we have had LED Lamps on the Motorway outside our place I have been getting very saw eyes. You don’t need any more powerful lamp than a Halogen Bulb if you are traveling no more than 100kph. Did you mention cost? If so, I missed it. Yes, he did. He asked to be provided the lights in exchange for the review. It was a barter that cost him his time. I work with electrical contractors and engineers who spend a lot of time and effort on getting the lighting right in buildings. This information will assist us in making an informed decision on our shop and task lighting. I have purchased some led lighting for my shop and will let you know how it works. IMHO too much information is better than too little. Great info, thank you! Though most of us aren’t filming in our shops, seeing a wider range of colors can help everyone. Crazy question. Would there be times you run both LED *AND* fluorescents since they are both installed and I remember you saying they are on separate circuits? In your photos above, the fluorescents, though not as bright, seem to create less shadows. Curious to see results in your shop with both flipped on! I appreciate the detail. I knew I could get brighter lighting with LEDs, but I didn’t realize the color can be this much more complete. Now I know why my flouresents behave the way they do. Very helpful. I sent an e-mail inquiry to American Green Lights recently. 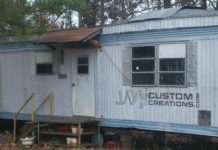 Jim from AGL called me back promptly and took the time to personally walk me through all their options, and explained everything in great detail. Wow, great service. I know Jay wasn’t trying to sell anyone on a particular brand, but based on my interaction with Jim, I had to share my positive experience! Very timely video! 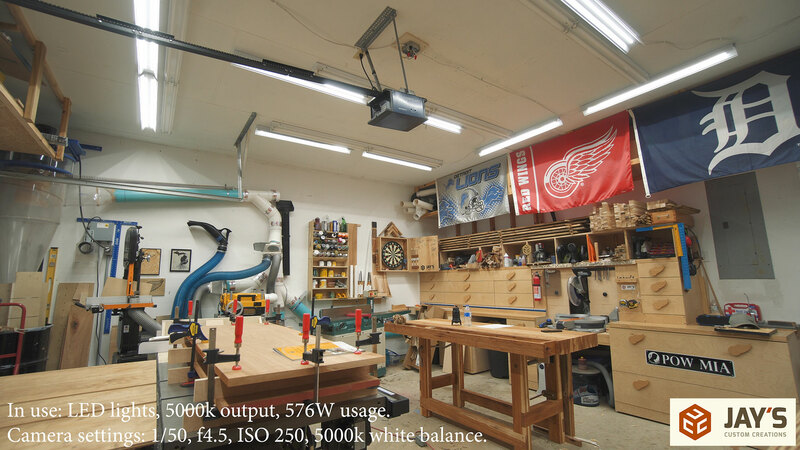 I’ve been thinking about upgrading the lighting in my shop which is approximately 32′ x 48′. Currently, the main lighting is 10 8′ high output single pin lamps. Have replaced them about twice in the 22 years I’ve been in the shop. I’m getting much older and lighting is important. Cost is a factor and I keep hoping the price will come down when production and competition increases. Thanks for the video! Thanks for the great video on this Jay! I was excited to get some info and pricing from AGL but they have not returned any of my emails. I have a tandem 3 car garage with 16′ ceilings and only have two fluorescent fixtures each with two 4′ bulbs. I was hoping to get some guidance from AGL on which products and how many I should go with and even sent them a sketchup of my layout. Hopefully they are just behind on returning emails but it has been over 2 weeks now.